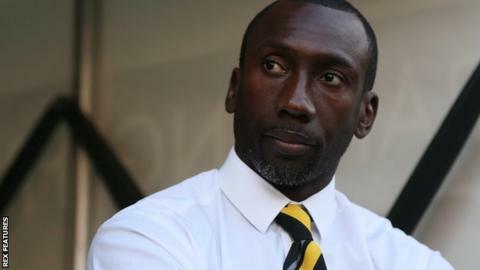 QPR have opened talks with Jimmy Floyd Hasselbaink about the Burton manager becoming their new boss. Burton have accepted an approach from the Championship club for the 43-year-old ex-Leeds and Chelsea striker, and negotiations with him are under way. Neil Warnock has been in interim charge at Loftus Road since Chris Ramsey was sacked on 4 November. Hasselbaink won League Two with Burton last season and the Brewers are two points clear at the top of League One. QPR are attempting to secure an immediate return to the Premier League following relegation last season, but are currently 12th in the Championship table, five points off the play-off places. Former boss Warnock was in an advisory role to Ramsey before the latter's dismissal, and the west London club have taken four points from three games since the 67-year-old took over. Hasselbaink, a former Netherlands international, was appointed by Burton in November 2014 after Gary Rowett left the Pirelli Stadium for Birmingham City. The Dutchman, who also had playing spells in Britain with Middlesbrough, Charlton and Cardiff, has won 33 of his 54 games in charge of the Brewers. He was previously manager of Belgian side Royal Antwerp and also spent time on the coaching staff at Nottingham Forest before joining Albion. Asked about speculation that he may leave Burton after Tuesday's 2-1 win over Millwall, which took them to the top of League One, Hasselbaink told BBC Radio Derby: "They can speculate, but I can't stop people doing that or control that. "The only thing I can do is make my players work as hard as possible and work with them. "I make sure I give them everything I have got and they give everything they have got for this club. That is what we will keep on doing."